The dual purpose of the investigation was to identify the sources of magnetic and bathymetric anomalies and to preliminarily assess whether or not they were associated with a potentially National Register-eligible submerged cultural resource. In addition, the investigation verified paleochannel boundaries within the inner-harbor water way. 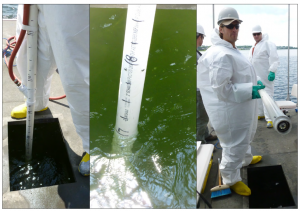 Upon completion of the target inspection survey, which utilized a Sediment Video Probe, a report was prepared and submitted for distribution to state and federal reviewers describing the results of the survey with recommendations regarding any potential needs for additional investigation. Operations were performed in accordance with OSHA regulation 29 CFR 1910.120 [e][I] (for working on HAZMAT sites).